Streamsie allows you to capture and stream live video from your iPhone or iPad. Stream live or upload to the Discover Video DEVOS system, to a Discover Video Arcus streaming account, or to your own server. Streamsie provides video recording up to HD resolution. If using Streamsie with your own server, you can create a free Streamsie account that uses your server values. Streamsie uses H.264 video for the higest quality live and VoD streaming. 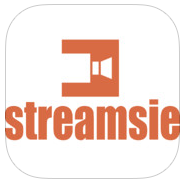 Streamsie iOS now supports additional streaming and recording resolution 640x360.